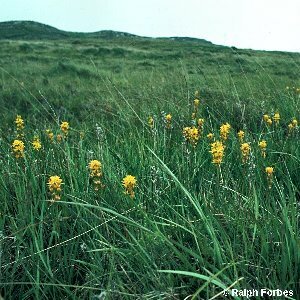 A beautiful perennial plant of wet and very acidic situations on bogs or moorland, with deep yellow, star-like flowers and iris-like leaves, normally growing up to about eight inches or so in height. Attractive reddish-brown fruits succeed the flowers. 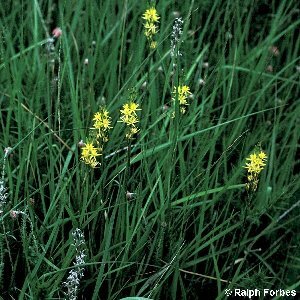 ‘Ossifragum’ means ‘bone-breaker’ and refers to the brittle bones of animals reared only on the calcium-deficient vegetation of places where this plant grows.